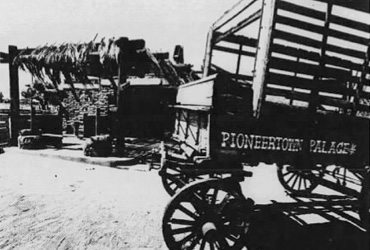 Since the filming of Western movies especially for television requires a different kind of camera technique from that used for theatre films, a new list of qualifications must be met by cowboy stars. They not only have to display winning personalities and look flashy in cowboy regalia, but must know how to ride a horse as well. That’s because the camera always works at fairly close range, avoiding long shots, as a concession to relatively small television screens. If a stunt man or double replaced the star cowboy in a scene close to the camera, the television audience might be confused. In the series of twenty-two television films which Autry has just completed, he’s done some jobs in front of the camera which normally would be handled by a double. While some of these jobs may not seem too breathtaking to the average layman, it must be remembered that Hollywood producers, while shooting a picture, would never expose the star to a possible sprained eyebrow or a hangnail. One of Gene’s pictures called for him to chase a bad man along the top of a moving freight train. Fro the sake of making it real for the video viewers, Autry managed to hurtle from on box car to the next without making a misstep. While shooting another film, Gene’s double wrenched his shoulder after sliding from a horse in an effort to bulldog a steer. Autry immediately took out on foot after the steer, and grabbed him by the horns and finally flipped him over right in front of the camera. 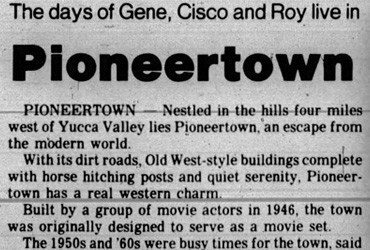 To make his television films, Gene and his company spent the summer at a place called Pioneertown, located in the California desert fifty miles from Palm Springs. They turned out two half-hour films (actually they run for twenty-seven minutes) a week, working a twelve-hour day. Each film as cost an average of $17-500. In shooting two video pictures at once, the director always looks for the possibilities of switching a location shot so it can be utilized in two films. If, for instance, the camera films a rider coming down the side of a mountain, it may also reshoot him going up the mountain for another picture. Autry is the owner of his television show, selling it directly to sponsors on a first- second- and third-run basis. The series is presented on Sundays at 7 P.M. by the Columbia Broadcasting System, the same network which offers his radio show on Saturday evenings at 8 o’clock. A total of twelve sponsors have bought the show so far, including the Wrigley gum company, which sponsors Gene in six markets. Viewers already have noticed the casual manner which Autry will unwrap a stick of gum and put it in his mouth right in the middle of his pictures. The outlaws never seem to chew gum, hover, which affords a new way of telling a good man from a bad man in the Western television movies. There is a general impression in the trade, which nobody has bothered to deny, that William Boyd alias “Hopalong Cassidy,” had much to do in making up Autry’s mind to go into television. 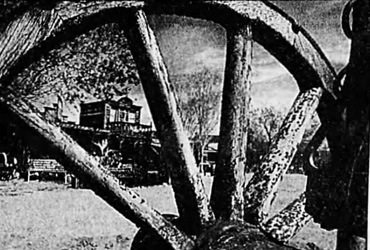 Where Boyd had access to his hold feature-length Westerns made for theatres, the only “Hoppy” films so far seen on video, Gene did not. According to Autry, Republic Pictures, which owns sixty of his old movies has offered to sell the whole lot to television for $2,000,000, but no deal has ever been made. Gene would sincerely regret such a move, feeling that old movie theatre products have no place in TV, and has said he would fight any such move with court action if necessary. In producing his own video films, Autry now is able to get himself before the viewing public each week, as Boyd is. Gene’s action, however, has stirred up trouble among some movie exhibitors who think he’s being unfair to their box-offices by offering a free show on television. Autry’s answer is that his video show might be looked upon as a trailer, which whets the appetite to go to the movie houses. Also, says Gene, television is making him known to youngsters who never heard of him before, thus building more movie audiences. He is thoroughly sold on the idea of television and feels cowboy stories can be presented int eh medium only by film, so maximum action ban be attained. Autry has been in radio for more than twenty years. In 1929 he gave up a telegraph operator’s job in Chelsea, Okla., and become a singing cowboy on WLS, Chicago. Several years later he moved to WHAS, Louisville, Ky., and in 1935 went to Hollywood. His radio and movie career was interrupted in 1942, when, against the strong protest of his motion picture studio, Republic Pictures, he volunteered for the Army Air Corps, remaining there three and a half years. When he came back he couldn’t get a movie job until finally, a year and a half later, he got financial backing to make his own movies and release them through Columbia Pictures.